Saddle up for an unforgettable ride through the mountains around Park City, looking over the alpine valleys, lakes and rivers while enjoying the comforting sway of a happy horse beneath you. All Season Adventures offers outdoor activities throughout the year such as rafting, horseback riding, hiking snowmobiling, skiing, and much more. Taking mountain climbing to a new level of fun and experience, for individuals, families and groups. This ranch provides a unique western adventure that features horseback riding tours, sleigh rides and customized camping trips. Provides an elegant horseback riding experience through scenic Deer Valley trails. All ages welcome and accommodated for. Scenic lodge nestled in the woods of Utah. Snowmobile and jeep tours and rentals, horseback riding, spa and massage services. Just 30 minutes from Park City, take the family rafting, ziplining, horseback riding, ATVing, tubing, or fishing. Guided tours, combo trips and rentals available. Outfitting service & equestrian specialists create memorable occasions for beginner to expert; riding lessons, cookouts, overnight trips, Clydesdale sleigh-rides. Located close to Park City , North Forty offers interesting outdoor activities year round in a picturesque wilderness setting. Red Pine Adventures can provide the ultimate nature experience for the whole family. Plan one today! Known as the best guided tour company in the Rocky Mountains. Offers fly fishing, horseback riding, snowmobile tours, and more. Rocky Mountain Recreation of Utah, Inc. Your source for four seasons of unforgettable Rocky Mountain adventure; dog-sledding, snowmobile and sleigh rides to fishing, hunting & horseback riding. The most authentic riding experience you can have! Rides and terrain available for all ages and abilities. 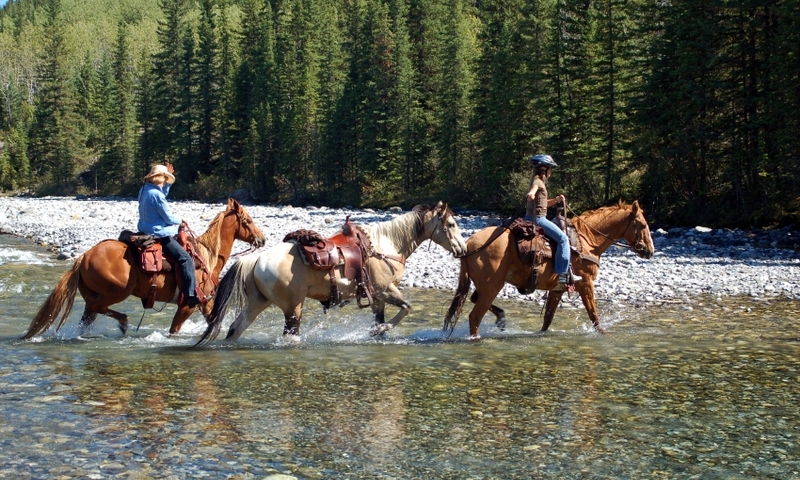 Year round Horseback riding for all ages through mountain trails. The forests surrounding Park City have a large network of trails to explore on horseback. With no previous experience necessary, horseback riding is a fun adventure for the entire family. Rides can last one or two hours, a half-day or even an overnight pack trip. Keep the camera ready for deer, elk and moose along the trails. Horses have played a strong role in the history of the Park City area, starting from the first trappers and traders who arrived. The deer, elk and moose, originally prey to the visiting hunters, still roam these protected areas. Now, ranches and public lands offer incredible opportunities to ride on the old trails. Let the beautiful animals take the burden on the trek, while you enjoy the surrounding scenes of high mountains and lush valleys. Riding switchbacks up the side of the mountain, the Deer Valley trails pass through aspen groves to find beautiful views of the valley below. Bring your camera on the family-friendly adventure for pictures of both the scenery and the riders. Longer rides are also possible, including a 3 hr. trip to the summit, where the views seem to go forever, stretching from horizon to horizon. Jordanelle Lookout is one of the more popular destinations for short rides out of Park City. Normally part of a 2-hour ride, this trail ends overlooking the Jordanelle Reservoir, Deer Valley and Park City. Located just north of Midway, Dutch Hollow is a system of trails inside the Wasatch Mountain State Park with 20 miles open for equestrian use. The Heber Valley Overlook Trail has views of the Midway Valley, Heber Valley and Provo River. In addition, Soldier Hollow permits horseback riding, available through various guiding companies in the area. This is a great opportunity to see the wildlife, including deer, elk and smaller animals that call the area home. Located to the east of Park City, the High Uinta Wilderness Area is restricted to only non-motorized travel. Plan an overnight pack trip to take advantage of the peace and quiet, free from cars, ATVs and other distractions. The Uinta and Wasatch National Forests have a number of great trails as well. As a suggestion, try the 4.6-mile Yellow Pine Trail, winding up past Duke Mountain before connecting with a larger network of trails that explore farther into the forest. Take a tour through the Elk Meadows or up to Stewart Falls on horseback. The sunset ride is another great option at Sundance, started by the Sundance Kid himself, Robert Redford. Most guiding companies have arrangements made with ranches in the area to allow access to trails crossing private land. These trails are often the best option for riding because of the lack of visitors and the sprawling views they offer. As the guiding company determines the overall experience in many ways, it's import to connect with the right company, so take a look at the options below before making a final decision. Connect with travelers planning a visit to Park City Utah.